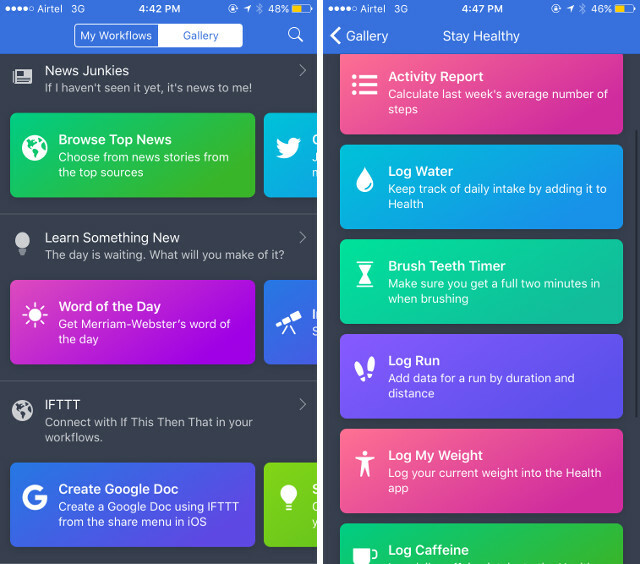 If you are an iOS user, WorkFlow is the best IFTTT alternative app you can get. In fact, the app is so good that Apple itself bought the app. 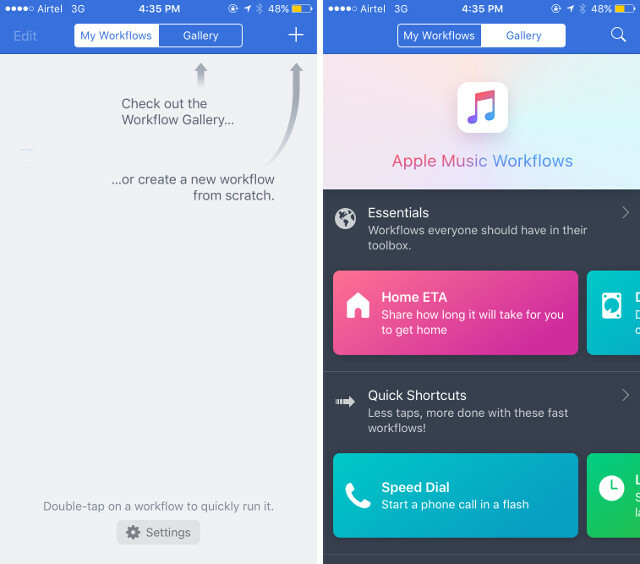 Since the Workflow app is now under Apple, it has got even more integration than ever before. When you launch the app, you are greeted with an empty screen. This is where all your Workflows will live in the future. Next to this is the gallery tab where you can find all the pre-created workflows neatly divided into different subheadings. This might be the best part about this app, at least for me. Most of your automation needs will be covered by these workflows templates, at least mine were. If you need something different you can create your own workflows. From automating settings in your iPhone, to creating gifs to posting pictures and messages on social media, everything is possible here. One of the best features of Workflow which is not available in IFTTT is to do with health. You can automatically log your water intake, running and other exercises, caffeine intake and also generate an activity report based on all these info. There’s even an app for Apple Watch which can log the data and can remind you to exercise or drink water depending upon the workflows you set. Considering its deep integration with iOS and other features, Workflows doesn’t only act as an alternative to IFTTT, it is the better one among both of them. Also, it is totally free. 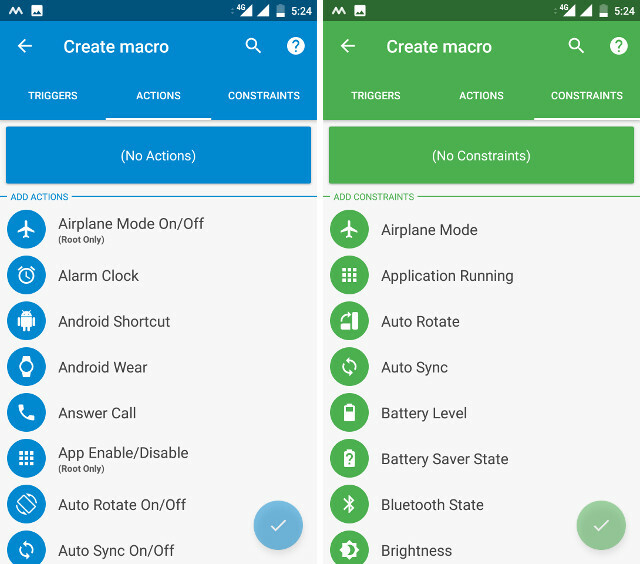 When it comes to automating tasks on Android there is no better way to do it than using the MacroDroid. It strikes the perfect balance between features and usability. It lets you take full control of your device. One feature you will miss if you are moving from IFTTT to MacroDroid is the lack of any third-party app integration, however, it is way better in automating your smartphone than IFTTT when it comes to inbuilt features. The interface is simple and easy to understand. To automate things, you create a “Macro” which is same as Applets on IFTTT. Every Macro has a Trigger which activates the automation. One thing that differentiates MacroDroid from IFTTT is that you can link more than one action to a single Trigger. Also, there are Constraints, which acts as an exception to the rule. 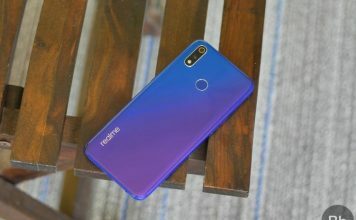 For example, you can set a Micro to play music and reject calls whenever you connect to a WiFi other than your office’s. Here, WiFi connection acts as a Trigger causing two different actions with one exception. 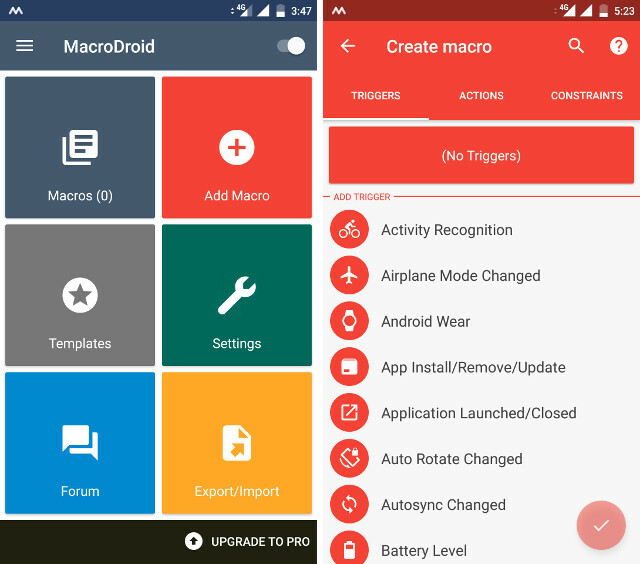 If you want to take control of your device and automate repetitive tasks, MacroDroid is your best bet. It’s available in a free version but that is limited to 5 Macros only, so you will have to get its Pro version if you want to create more Macros. There are different kinds of automation you can perform using different apps. 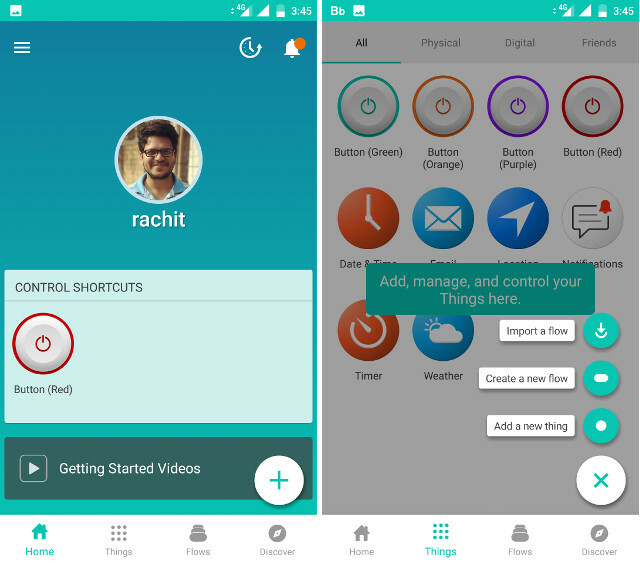 Some control the inbuilt settings and features of the devices and perform actions on third-party apps and some control your smart devices. Stringify is the best app you can get if you are looking for the latter. 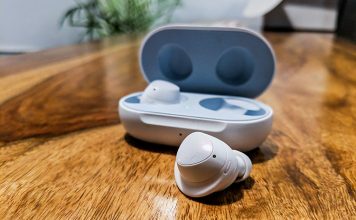 While IFTTT offered various Applets for smart home devices, Stringify takes it up a few notches. Stringify has API for almost all of the popular smart home devices. From Amazon Echo, Google Home, Nest devices to Phillips Hue smart lights, everything can be controlled and automated using Stringify. Not only that, you can also automate things like generating weather reports, adding events to your calendar, RSS news feeds, etc. They have a number of templates with predefined flows to help you get started. One of the best features of Stringify is its ability to support multiple-steps automation. For example, you can set a flow to dim the lights on your smart lights and announce bedtime on your smart speaker based on the time of the day. There is so much one can do with Stringify. You have to explore to understand the depths of the app. The only drawback is that the app is slow to load and performs more like a web app than a native app. Having said that, it is also one of the only two apps which have clients for both iOS and Android platforms. Every Android user must have heard about Tasker at some point of time in his life. While Tasker is not similar to IFTTT, it makes the list because it is undoubtedly the most powerful automation app on Android. With Tasker, you can automate every aspect of your device. However, this ability comes with a price and I am not talking about money. The price you will pay is your time. Tasker has a very steep learning curve. Yes, unlike IFTTT, which is fairly easy to use, Tasker doesn’t help you even a little bit while understanding its usage. You will have to research on the web, watch tutorial videos and learn the app by hit and trial method. However, all this learning will pay off in the end. Tasker is for someone who really likes to dig deep into the functionality of an app to scour through its secrets. If you are such a person then you will be thoroughly rewarded by the app. If not, look at the other apps on this list. You can check out our guide on how to automate your Android smartphone using Tasker to understand the app better. 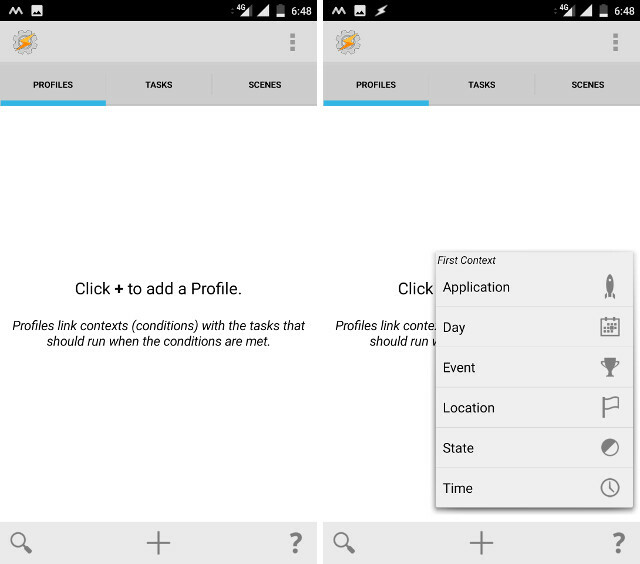 You can also check out our list of the best Tasker profiles. Automate is a decent IFTTT alternative app which lies somewhere in between MacroDroid and Tasker when it comes to functionality and user experience. One neat feature is that as soon as you open the app, you get an option to create a daily backup automation. The feature is very useful as we are seeing more and more cases of malware attacks on Android. Other than that, its interface is more similar to Tasker than to MacroDroid or IFTTT. However, it does provide users with pre-build templates to guide them along the way. 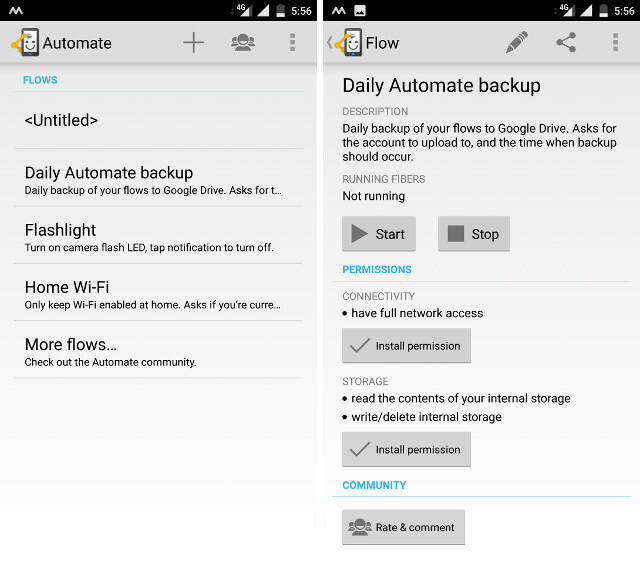 The functionality is more or less the same to IFTTT, you create a flow to automate certain things on your phone. There is one thing which really irks me when using Automate. You are made to install permissions for every little thing you are trying to do with the app. That really feels like a hassle to me. However, if you are looking for an app which has more features than MacroDroid but is easier to learn than Tasker, this is the one for you. Automate is available in a free version but it’s only limited to 30 automation blocks and you’ll have to get the full version to create more. Microsoft is known for developing some really good apps for both iOS and Android platforms. Well, Microsoft Flow is no different. The app is snappy and has a great UI. As it is developed by Microsoft itself, it plays very nicely with all its services like OneDrive, OneNote, Office etc. Not only that, it has also integration for almost every third-party app you will ever need. However, there are reasons which made us place this so far down the list in spite of its advantage of being a cross-platform app. Firstly, you have to create a Microsoft Account to use this app, there is no other way you can log into the app. That is fairly restrictive in my opinion. Also, the app focuses more on the business side of things. As an individual user, you can make this app work for you but it will be hard as most of the pre-build flows that come with the app focuses on enterprises. 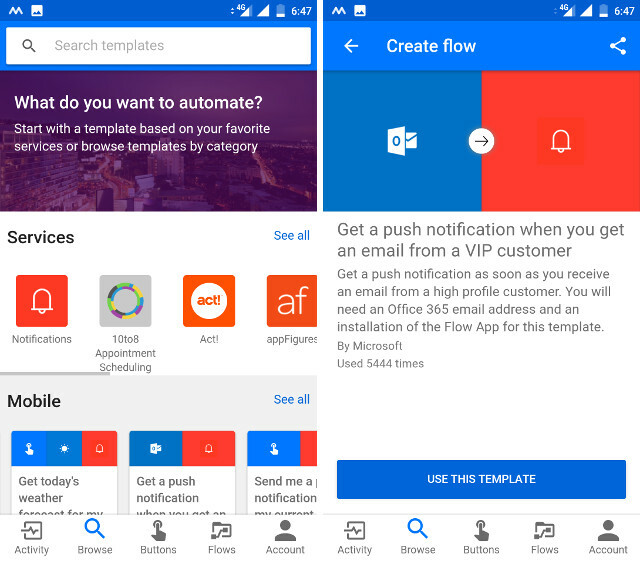 However, if you are looking for a cross-platform app, Microsoft Flow is one of the very few choices out there. You just need to find your way out of the clutter. If having an app as your alternative to IFTTT is necessary for you, Zapier won’t cut it for you. 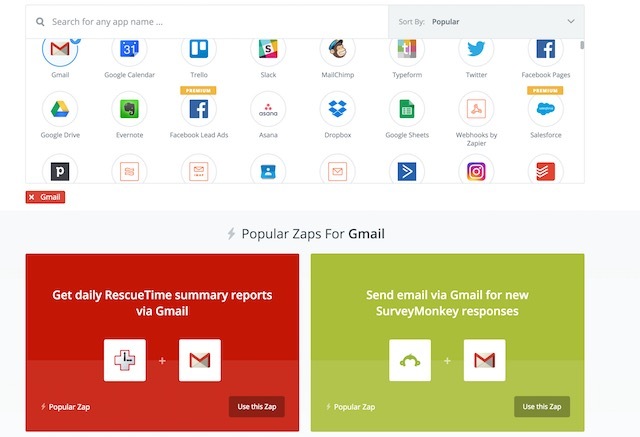 However, if you are ready to give other options a try, there are a lot of web apps out there which just gets the job done, and Zapier is the best among of them. It focuses on automating tasks which are dependent on various third-party apps. The idea here is that you don’t have to open multiple apps every time for a repetitive task, you can just automate the task using Zapier. The best part about using Zapier is that you can discover numerous zaps (automated workflows) related to an app when you click on it. You can use it for free as an individual or buy into pro plans if you are planning it use the services for a team. It is different, it is good and it is worth your time. Automating your workflow can really help you in getting productive. There’s only so much one can do in a day. The best way to utilize your time judiciously is to automate the repetitive tasks, so that the same tasks don’t eat away your precious time. While IFTTT is a great automation app, the aforementioned services and apps are some great automation apps out there. We have included apps similar to IFTTT, as well as apps that are more powerful automation apps, so there’s something for everyone. So, which IFTTT alternative will you be using? Let us know your thoughts in the comments section below. Also, tell us about your favourite automated workflows.